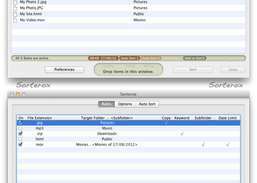 Sort, organize, copy and backup files and folders with a single drag & drop, using your own rules. 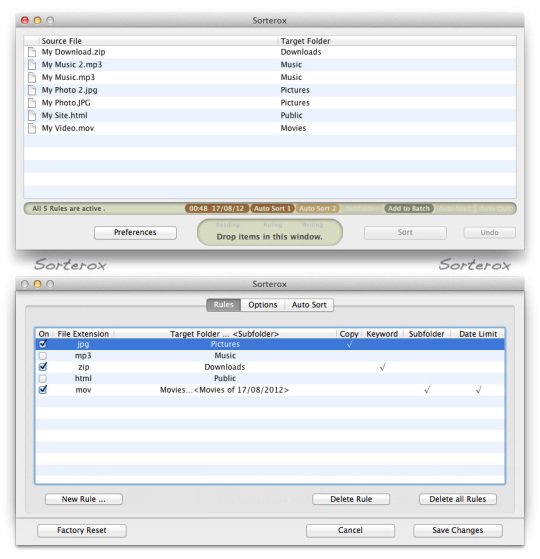 Sorterox for Mac is an application for copying, sorting, and organizing files and folders on your Mac. Sorterox for Mac is not available from the App Store but is readily available from numerous download sites. The demo version adds a couple of letters to all file and folder names, but this can be defeated by purchasing the full version for $9.99. Sorterox for Mac installs easily. Rename, copy, move files and folders with a single drag-&-drop using presets. View and manage memory usage in the menu bar.